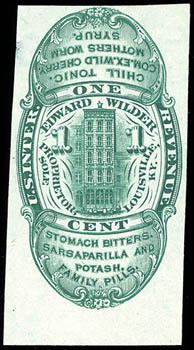 Wilder, Edward, 1¢ black, trial color large die proof, on India (51x99mm), showing faintly inked impression of the top of the Dr. Crook's Wine of Tar issue (RS65) at right, fresh and Very Fine, ex-Joyce. Scott No. RS265TC1 $225 for normal. 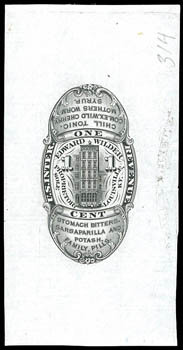 Wilder, Edward, 1¢ green, imperf, watermarked USIR, clear to huge margins, deep color, couple small thins, otherwise F.-V.F., scarce with only 35 examples recorded in the Aldrich census (18 of which are reported to be faulty). Wilder, Edward, 4¢ lake, large die proof, on India mounted on card (49x76mm), bright and fresh, Very Fine. 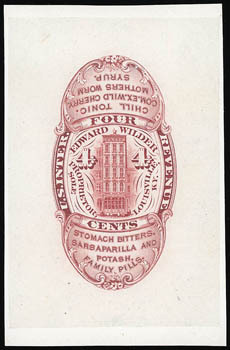 Wilder, Edward, 4¢ vermilion, die cut, old paper, exceptional centering, rich color, central thin, Extremely Fine appearance. 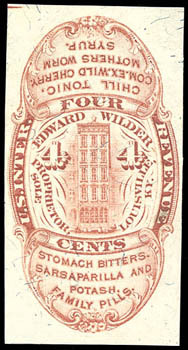 Wilder, Edward, 4¢ lake, imperf, silk paper, clear to ample margins, strong color, filled thin, Very Fine appearance, only 47 examples are reported in the Aldrich census (of which 14 are reported faulty).